I have only ever made Victoriana inspired, vaguely Steampunk costumes before so it was interesting to attempt a medieval-ish outfit, circa 1500, for a Knights at the Castle event at Oakham Castle. I gave myself a £5 budget and a 5 hour time budget for my ensemble. Was this possible? I had been collecting linen garments, bought at charity shops and jumble sales, for a couple of years. These were going to form the basis of my outfit. I searched through my wardrobe for something to wear as my shift, the garment which was worn under all costumes from this era. Think of it as a cross between a vest and a petticoat, a loose nightshirt type garment usually made of linen. I found a cream top to use (I've allowed this as a "freebie" in my costings as it is something from my wardrobe). It had a floral embroidered overlay and I considered cutting this away to leave the garment more "plain". Then I realised I could save some cutting and stitching by simply turning it inside out so the plain lining was on the outside. The linen trousers had an elasticated waist and I thought I would simply cut out the inside leg seams and make into a skirt. 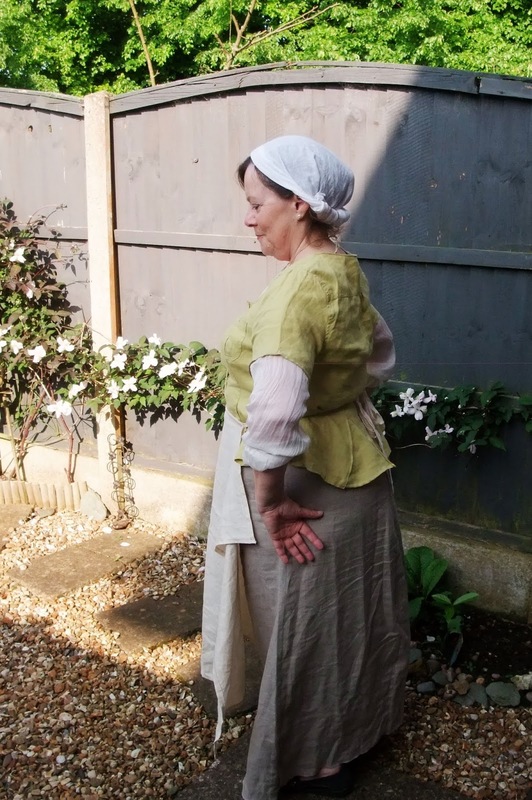 However as the trousers were tapered towards the ankles I cut away the waist to become the new hemline so that the skirt now tapered out from the hips to the hem. The hems became the waistline. I stitched a new casing, re-used the original elastic, and created a simply lapped side opening which I fastened with a button and a hair elastic. I find hair elastics are brilliant for creating button loops, cheap and a great choice of colours. Time to make skirt - approx. 1 hour. The apron had some embroidered motifs which were far too fancy for a 1500 working woman's apron, so I cut a section from the centre of the apron so that only one of the motifs was visible (I plan to unpick this in due course). I cut strips from the edge of the apron which I used for the waist ties. I had seen that aprons from this era used a different method of joining the skirt section to the waist tie section. Time to make apron - approx. 45 minutes. This was the most fun to make! Firstly I chopped off the sleeves to above the elbow - these sections would be used for godets at the waistline. Then I hacked the neckline to make it lower and squarer. I finished the neckline by speedily overlocking and then turning the edges under. I worked a duplicate set of buttonholes opposite the original buttonholes so that I could lace up the front of the jacket with a piece of cord I found in the craft cupboard. I inserted the godets and hemmed them. Time to make jacket - approx. 2 hours. I had planned to make a coif (cap) but realised I didn't have time to draft a pattern (something for next time). I had seen some medieval head wrap, turban type ideas. I experimented firstly with a silk scarf but it was way too slippy and kept falling off! I had a couple of scraps of muslin in my tablecloth stash so I made a large triangle out of them and experimented until I could tie it in what I thought was a reasonably effective way. Time to stitch muslin headwrap - approx. 30 minutes. 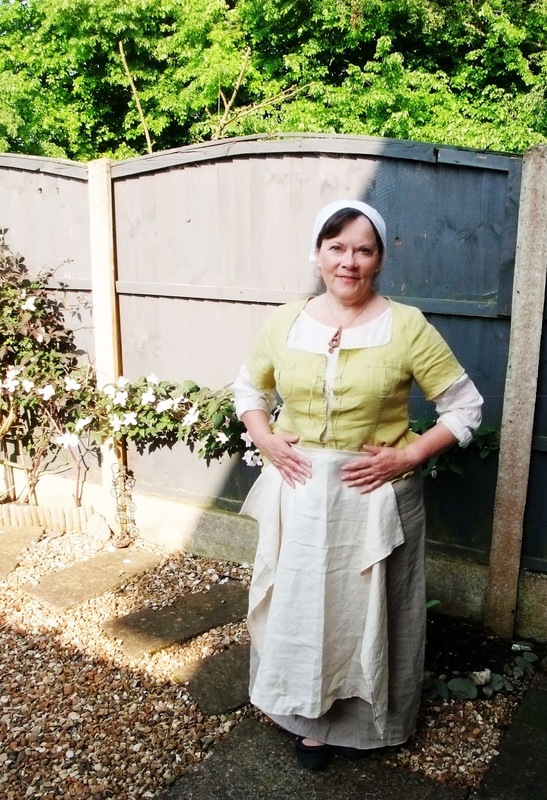 I tied the original drawstring from the linen trousers round my waist so that I could hide my watch under the apron. I had a little vintage Welsh love spoon pendant which I thought was a suitable necklace. I wore simple pearl earrings (not authentic I know but ... ) and I removed my wedding ring. My shoes were not really in keeping but a pair of black flat Mary Janes, the best I could do. Whilst parading about in garments in various stages of completion I made my husband jump! I also scared the dog in the full 1500 get up. Anyway, the outfit was within my time and cost budgets and an interesting upcycling project.